Nowhere else in North America do you find such a dramatic transition from desert floor to alpine peak than in Chino Canyon, a world-renowned Palm Springs landmark providing the gateway to the Palm Springs Aerial Tram and to the 270,000 acre Santa Rosa and San Jacinto Mountains National Monument. Its massive cone seems like a huge welcome mat, providing residents and visitors alike the sense of arrival at their destination. In addition, when you stop and look up the canyon the welcome mat lies before mountain walls that seem to reach out like massive outstretched arms of a hospitable friend. The 376 acre area proposed for preservation is up the Cone at the mouth of the canyon. It is blessed with magnificent views, a year round flowing stream, Native American cultural sites and a vital connecting corridor for the bighorn Sheep. The specialness of the area is given to those who have the opportunity to walk the land. You hear the stream, smell the fragrance of the desert and feel the mountain peaks towering overhead and all around you. The Canyon is the ancestral home of Cahuilla Indians who lived in areas along Chino Creek and the Cienega oasis until 1860, when a catastrophic flood forced the people to move to the desert floor. 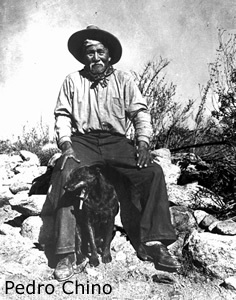 The canyon is named after 'Old Man Chino', the father of the last Cahuilla Shaman, Pedro Chino, who lived in the Canyon until his death in 1939 at the reported age of 113. During his years on the Canyon, Pedro Chino treated the sick using medicinal plants from the area and the healing waters of the hot springs. In his words, "This land is alive. It is alive. The heart is fire, the heart of the land. You can see where it breathes." Archaeologists have documented many artifacts from the early Cahuilla encampments along the creek, and within the village of Mala located near the hot springs, but there is still much to discover. Mountain Cahuilla elders tell of petroglyphs in the Shadowrock area and other parts of Chino Canyon and Snow Creek. To the Mountain Cahuilla, these Canyons continue to be a sacred and spiritual place. To visitors and residents alike, the Chino Canyon and Snow Creek alluvial fans are treasured landmarks along the entry corridor to Palm Springs. Chino Canyon is perhaps the most recognized and photographed landscape in the Coachella Valley, providing inspiration to artists, photographers, poets and musicians. An equally cherished landmark, that took the efforts of architectural conservationists to preserve, is the mid-century modern, Frey/Chambers Tramway Gas Station that now serves as the Palm Springs Visitor Center at the gateway to Chino Canyon and the Palm Springs Aerial Tram. High in the Canyon, below the oasis, in an area bordered by steep canyon walls, is the historic crossing area of the endangered Peninsular bighorn sheep. The San Jacinto bighorn is a particularly fragile species. Several years ago, disease and the impacts of human encroachment caused this herd to drastically decline in number. Today, with the help of private and public agencies, this herd has nearly tripled in size. Use of the crossing enables the herd to access nearly 45 percent of their historic habitat. Recovery biologists believe that the preservation of this crossing site that travels through the proposed Shadowrock project is critical to the survival of this herd. At the highest point in the Canyon is the Palm Springs Aerial Tramway station and several parking lots. The Winter Park Authority, which governs the Aerial Tram, has a mandate from the Army Corps of Engineers to reduce the amount of traffic on Tramway Road. All photos credit: Tom Brewster Photography unless otherwise specified. Pedro Chino photo credit: unknown.